To celebrate the twenty-fifth anniversary of the magazine, Rolling Stone published three special issues in 1992. The first was called "The Great Stories" and here's how founder and publisher Jann Wenner introduced it: "We see this issue as a kind of impressionistic history of the past quarter century. We started by choosing thirty of our best stories, then asked the writers to speak about themselves, about the reporting of their story and about the context of the work—i.e., what it's like to work at Rolling Stone." Proving that even a blind pig can find an acorn if he roots hard enough, here my scruffy tale of "Kids In The Dark" kept company with stories about stories by the likes of Hunter S. Thompson, Tom Wolfe, Mikal Glimore, Ken Kesey, Greil Marcus, Robert Palmer, and P.J. O'Rourke. Clearly, I was about ready to retire from journalism. After the drug-inspired murder of a teenager and the suicide of one of the killers, how do you get their terrified friends to break the silence? What does a dead body in the woods mean in 1984? Every story starts with a question, and that’s the one I was asking myself on my first drive to Northport, Long Island. 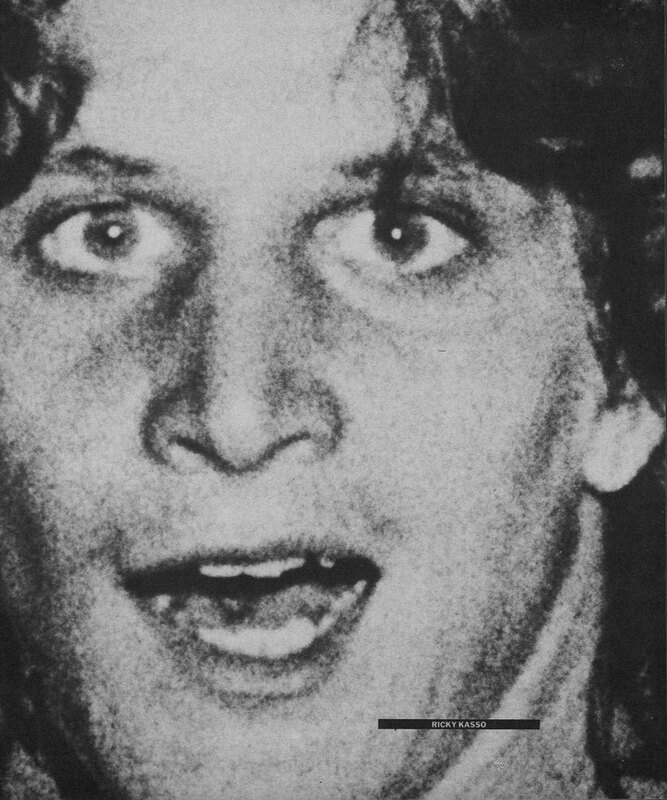 The story — the murder of a teenager named Gary Lauwers by two of his friends, one of whom, Ricky Kasso, subsequently hanged himself in prison — had already occupied front-page space in the Sunday New York Times and was on its way to setting some kind of continual screaming-headline record in the lurid New York Post. I didn’t really care about the drug-induced Satanism that the newspaper reports trumpeted, and as for the violence, it was run-of-the-mill by city standards — so what that it happened in the lily white suburbs? What interested me were not the sensations themselves — drugs, Satanism, violence — so much as what they were symptomatic of. And that kept leading me back to my question, which really asks not so much about how these kids died as about how these kids lived. When I got to town, there were reporters in the trees. Literally. Minivans and minicams, the London Times and the National Enquirer, Good Morning America, the Today show and The CBS Morning News were swooping down to see what tasty bits the lion had left behind. I waited for the daily press to migrate to a different corpse and stayed for several weeks more once it did. My local “office” became the phone booth by the harbor, where frogmen were diving for the murder weapon in the first few days. The fact that I looked younger than my twenty-six years, dressed in T-shirts and holey blue-jeans and sneakers, had grown up in a similar town and could more or less talk the kids’ language gave me entree into their world. I blended in so well that I was occasionally mistaken for “one of them” by other reporters and asked silly questions. But my desire to hang out with them — and not ask questions for long stretches — also made the kids suspicious. In fact, I had to convince some of them that I was not a narc. What more perfect cover than a longhaired, sunglassed Rolling Stone reporter? The adults had their own suspicions. The police twice asked for my ID as I walked down the town’s main drag, and I was later almost arrested for “contributing to the delinquency of a minor” when an officer found two of my sources drinking beer in my rental car late at night in a strip-mall parking lot. Did he expect me to be interviewing them in their kitchens with their parents listening in? The police chief later told me there had been some suspicion I was a drug dealer. What more perfect cover than a longhaired, sunglassed Rolling Stone reporter? I talked to everybody I could con into talking to me: friends and enemies of the killers and the killed, schoolteachers, drug counselors and dealers, lawyers, waitresses (they always know a lot), cops, parents, doctors, psychologists, prison wardens. The key, as always with sources for whom there is a natural reluctance to talk, is in convincing them you are seeing the story through their eyes and will tell it from their point of view. I kept a separate outfit in my car trunk — jacket, tie, button-down shirt, dress shoes — to wear whenever I needed to look respectable for the adults. (Unfortunately, my phone booth was not of the closed Superman variety, and changing on the fly was a constant problem.) I took material on the record, I took material on a “not for attribution” basis, and I took a great deal off the record. I ended up with forty-four hours of taped interviews. Many of the kids I talked to were scared and angry and hurt: There’d been a murder, a suicide, there’d been widespread complicity in keeping quiet (which was the trigger for my interest), and now there was the anticipation of a trial for the remaining defendant. The feeling of alienation and desperate self-dramatization in their lives was pathetic and touching. The fact that every “adult” institution had failed them — family, school, church, work — led me to abandon all my interviews with the adults, the authority figures, and to focus exclusively on the kids’ point of view. It was painful to let go of half my research, but I felt that even by their absence, perhaps especially by their absence, the world of the adults would be felt in the story. This strategy proved too arty, and perhaps too arch, for my editor, Carolyn White, who retitled the piece “Kids in the Dark” and insisted I write both an introduction and brief background notes to begin each section. I wrote the intro in a purple tone: My goal was to write something that Tom Waits could talk-sing. That kind of feeling. Three things happened after the story was published that gave it a longer shelf life than most. First, the attorney for the surviving attacker, Jimmy Troiano, subpoenaed all my notes and tapes. Of course, we would not give up the material; it would set a horrible precedent. Besides, my word — and the trust of all those kids whom I’d talked to — was on the line. I didn’t feel the need to do the defense’s work for it. In paranoid fashion, I split up the tapes and moved them to friends’ apartments around New York City. Certain key tapes were copied, labeled black sabbath and put in a safe-deposit box. Rolling Stone’s lawyers diligently defended my right to this material, and I sought out other writers who would publicize the matter if it looked as if I were going directly to jail without passing go. Luckily, after much ado and a legal bill that probably dwarfed what the magazine had to pay me to write the damn story in the first place, we won the day in court, and my mother stopped worrying about how to smuggle in a nail file in a bowl of chicken soup. The second thing was that a young playwright in Chicago named Rick Cleveland was so moved by the story that he contacted me and asked if I would let him concoct a play out of it. Yes, I said, if I could do it with him. A year and a half later, Kids in the Dark — the headline was now a tide — had a successful run in Chicago. It was a one-act, with the murder coming in the first five minutes, and the rest of the play attempting to unwind it. What about film rights? asked everyone. Well, with perfect timing, the movie River’s Edge opened just as the play closed, and the stories were, shall we say, very similar. The third thing happened a bit later. A sleazoid book about the crime appeared, Say You Love Satan. The author had used as much of the article as he possibly could have — all without acknowledging the source. Sue! I thought. Settle! said my agent, wisely, and we marched off to Bantam Books (the august publisher) and entered into a conference with — guess who? — the same lawyer who had a few years earlier kept me out of jail and had recently become in-house counsel at Bantam. Everything this writer did was legal, she said; it might not be nice, but it was legal. Sue us! she said. Long live the First Amendment, we cursed, leaving the room and “Kids in the Dark” behind us. This entry was posted in Features and tagged Kids In The Dark by admin. Bookmark the permalink.